In a twitter post just before Mahathir Mohamad was sworn in as Malaysia’s new Prime Minister, blogger mrbrown, also known as Lee Kin Mun posted a dictionary update he thought was necessary. He made this reference to how Mahathir came back to politics – and to holding the very position he held back then – even after 15 years. He is the Tunminator, haven’t you heard? ? This is because Arnold Schwarzenegger is famous for his role in the movie ‘The Terminator’, and especially so for the movie’s catchphrase, “I’ll be back”. 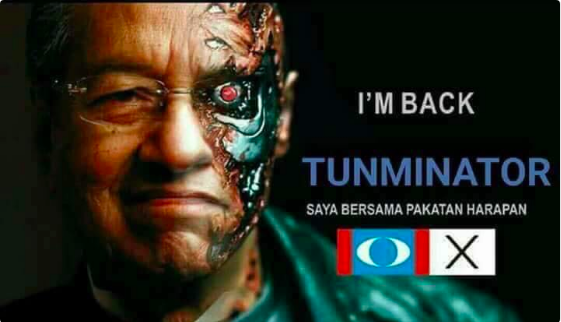 This sentiment of Mahathir as the Terminator who keeps coming back was even echoed by Emeritus Senior Minister Goh Chok Tong, who said in a Facebook post yesterday, “Lee Kuan Yew who famously said, Watching Mahathir fight Malaysian GE14 reminds me of Lee Kuan Yew who famously said, “Even from my sick bed, even if you are going to lower me into the grave and I feel something is going wrong, I will get up”. 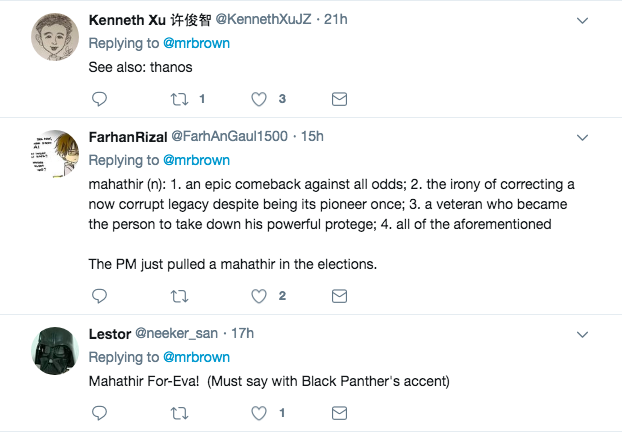 Netizens and fans of The Avengers were more than happy to oblige mrbrown on this thread. Lately, mrbrown has been using power-hungry inhuman extremist movie characters such as Thanos, The Terminator and the likes to describe politics. Leaves a lot to be considered.